Robles Park consists of twelve apartment homes surrounding this initial phase of the garden with approximately another 40 multi-family apartments close by. 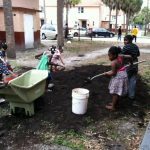 This project invites all the families to participate in the garden. This project includes an educational component as well as an art project. From the children’s perspective it takes a long time for a seed to become a harvest. To provide interest and successful participation, we propose creating a sculpture out of recycled metal items. Each time they come to the garden they have the opportunity to add to this artwork, under the supervision of a local artist. The art project will communicate the principles of the garden project. 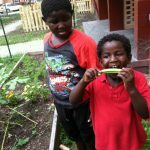 By connecting art, recycled material and gardening, we are teaching children to create art from discarded materials, value to the earth by reducing landfill, and gardening to tend and eat the food they grow, all reducing their carbon foot-print. 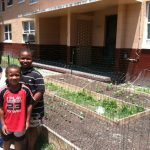 The Robles Park Village community garden project will demonstrate a successful model that can be replicated in other low income, high density housing programs. 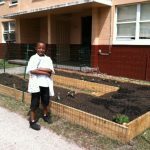 Residents will have a successful garden, improve the quality of activities available for their families, improve the quantity of fresh produce served in their homes, learn about art, civic engagement and caring for their environment. 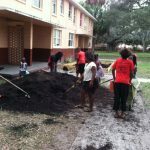 The Robles Park Village community garden project is being funded by the Sustany Foundation, Tampa Heights Community Garden, the Tampa Garden Club, and the residents.